Welcome to (almost) spring! 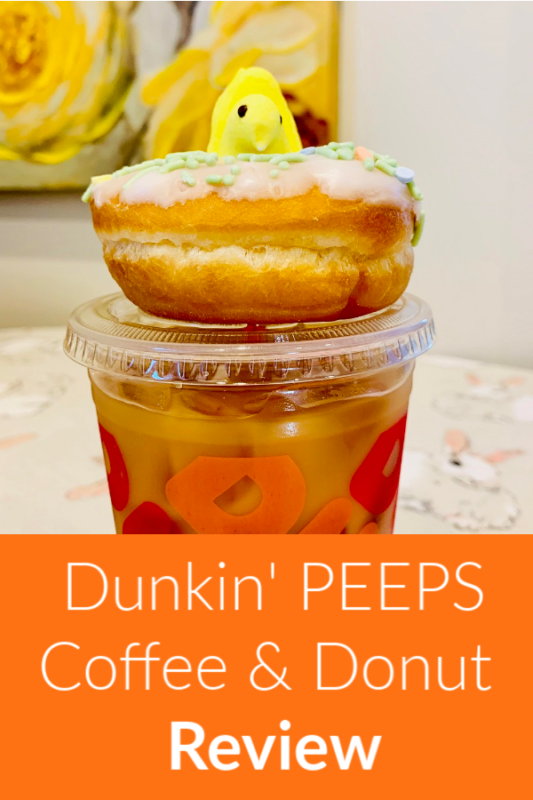 Dunkin, my #1 favorite coffee chain, has JUST released their new Dunkin Peeps Coffee flavor, PEEPS® Marshmallow Flavored Coffee and espresso drinks, and the PEEPS® Donut. Just in time for spring and all things pastel. Dunkin’, a Massachusetts-based brand, announced last week that they were going to release a whole line of new spring flavors in 2019. Not only did they release the new Dunkin Peeps coffee flavor, they also released a Chocolate Cherry Cold Brew, the new Sweet Sriracha Bacon Breakfast Sandwich, Iced Tea Lemonade, and Frozen Lemonade. However, it seems like most of the buzz has been about the new Peeps-flavored coffee and Peeps-inspired donut. And with good reason! They’re a fun spring collaboration, perfect to get people ready for sweet treats and Easter baskets. I decided to pick up a Dunkin Peeps coffee and donut to try them out. TBH, I usually stick with my regular French Vanilla iced coffee, but I thought the Peeps flavor was a super cute concept and wondered if the marshmallow flavor could become a contender against the usual French Vanilla. I always use the Dunkin app to order, and the Peeps flavor option popped right up under the “Featured Items” section. I ordered a medium iced coffee with whole milk, 1 shot of the Peep flavor swirl (default in the app is 3 pumps), and a packet of Splenda. Upon first sip, I noticed it was pretty sweet since the flavor was all at the bottom of the cup, so I stirred it up with the straw and tried again. It was still sweet, but now it was blended with the iced coffee. The flavor is not overwhelming, and tastes kind of like a combination between marshmallow and vanilla. I found it sweet and refreshing–perfect for an afternoon treat. The flavor swirl was thicker than the regular flavor shots, like French Vanilla. So the Peeps iced coffee actually felt “thicker” when I drank it. I guess you could compare drinking a flavor shot to drinking skim milk and drinking a flavor swirl to drinking whole milk. It just feels different. I am really glad I only got one flavor swirl pump. I think if I got the default of three pumps, it would have been way too sweet. But I could have also eliminated the Splenda packet, too. FYI, three pumps of the flavor swirl is 37g of sugar in a size medium, and a medium has 180 calories. Nutrition chart. I’d definitely order the Dunkin Peeps coffee flavor again! I thought it was refreshing and reminiscent of Easter candy and treats. 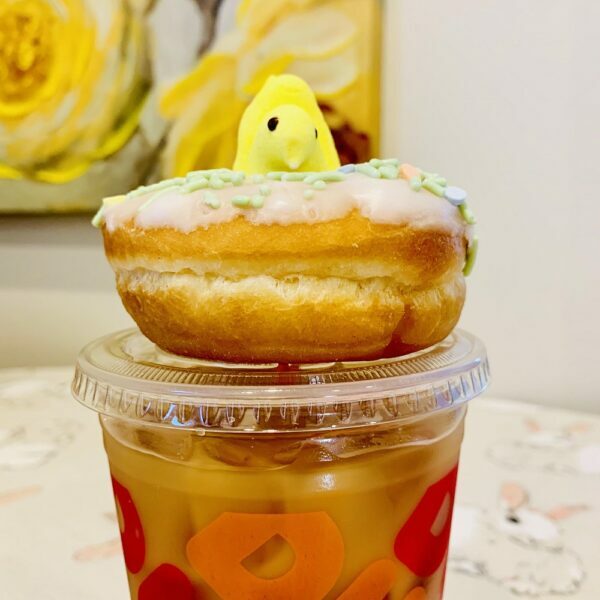 Along with the Dunkin Peeps coffee, Dunkin also released a Peeps donut. 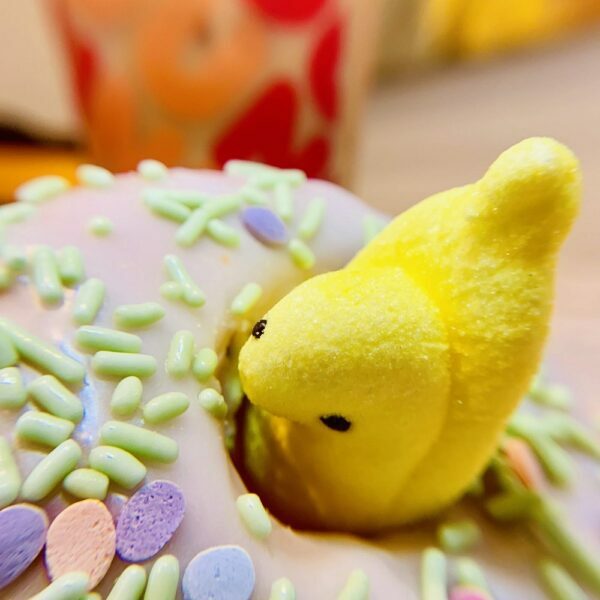 It seems like the Peeps donut is a vanilla frosted or glazed donut as a base, a layer of flaky white frosting, and lovely pastel sprinkles shaped like eggs on top. Then, a classic yellow Peep adorns the donut. They place him inside the donut–almost like he’s nestled in a pool float! The donut seems thicker than a regular donut. But the flavor is very straightforward and tastes just like a glazed/vanilla donut. The egg-shaped sprinkles are larger than regular sprinkles, so they added a bit of crunch to the experience. The donut was also quite sweet between the Peep, the frosting, and the sprinkles. You only need a few bites to get a big sugar rush. Next time, I’d probably split it with someone or (try) to save half for later. 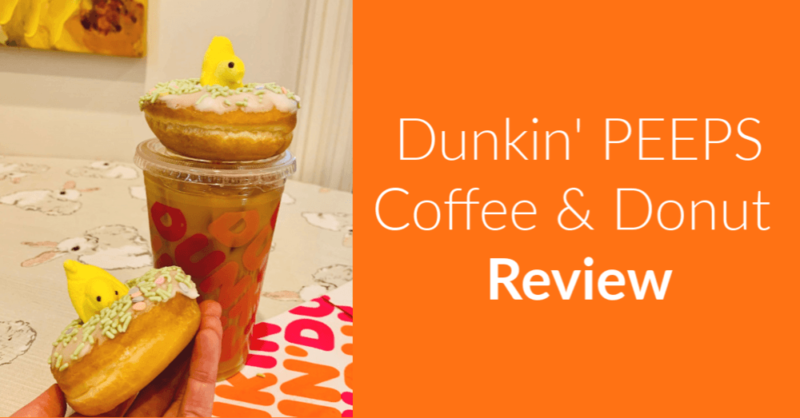 If you try the Dunkin Peeps coffee or donut, leave a comment below to let me know what you thought of them! Thanks, Jenny, I hope you like it too!